This Irish blessing plaque features a pot of gold with a clover. and at the end of all your rainbows may you find a pot of gold. 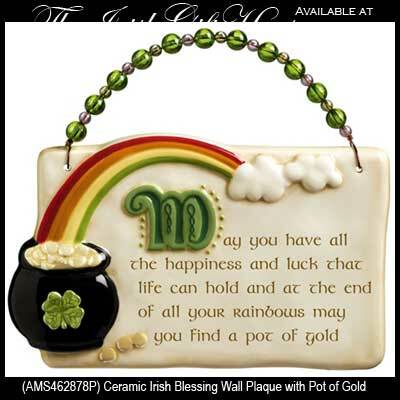 This wall plaque features an Irish blessing that is enhanced with a pot 'o gold at the end of the rainbow. The ceramic Irish blessing plaque has a raised dimensional design that measures 6" wide x 4" tall, not including the beaded wire hanger.